March Madness: After The Upsets, Which Team Do You Like Now? : The Two-Way Brackets have been busted across the nation. Kansas, Duke and Syracuse are among the top teams that bounced out. Now who do you think will win the Division I men's college basketball championship? Kentucky's Andrew Harrison goes up for a shot during his team's victory Sunday over Wichita State. The Wildcats' win sent the previously undefeated Shockers home. Duke went down the first day, losing to nearly unknown Mercer. Syracuse was bounced out on Saturday by Dayton — a team that hadn't gone very far in 30 years. Kansas — the school where the first basketball coach was the game's inventor, James Naismith — lost to Stanford on Sunday. Wichita State, one of the four regional No. 1 seeds and the only team that was undefeated this season, is undefeated no more. 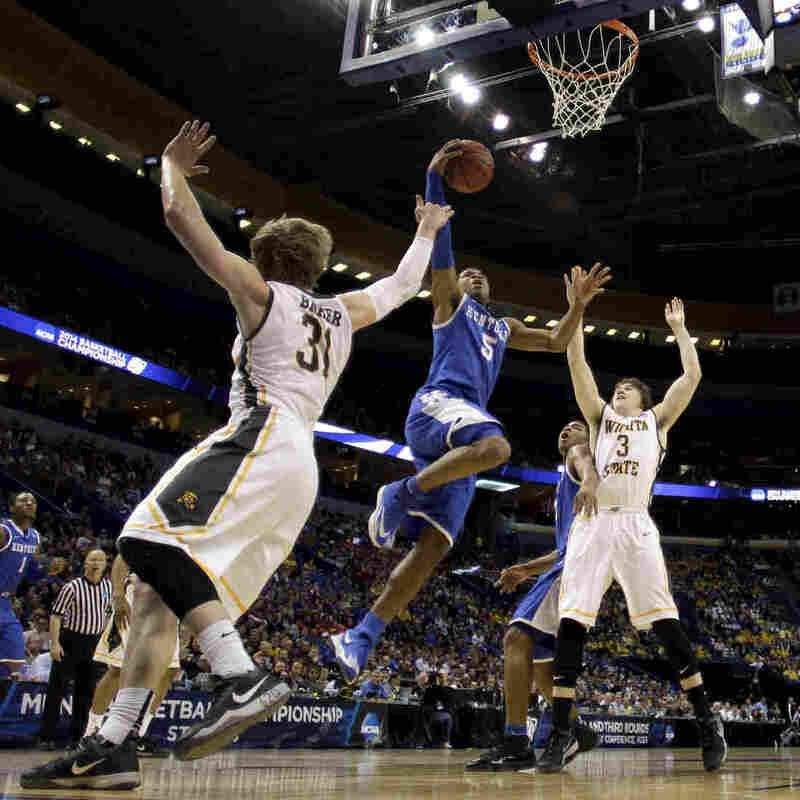 The Shockers were sent home Sunday by Kentucky. There have been fewer upsets so far in the NCAA Women's Basketball Championship tournament. The four No. 1 regional seeds — Connecticut, Notre Dame, South Carolina and Tennessee — all advanced over the weekend. So did the four No. 2 seeds — Duke, Baylor, Stanford and West Virginia. Women's play continues Monday and Tuesday. Click here to see that tournament's brackets. Creighton, whose star — Doug McDermott — is arguably the best player in college basketball, is out after losing to lower-ranked Baylor. As NPR's Tom Goldman said on Morning Edition, a "wide open tournament" is proving once again that madness really does descend in March when the Division I men's college basketball championship gets going. The upsets so far mean no one's going to win $1 billion from Warren Buffett and Quicken Loans, and that there are no perfect brackets among the millions that fans filled out for Yahoo Sports. So with the "Sweet 16" now set, it's time for everyone to regroup. Maybe the team you picked to win it all is still in the tournament. Michigan State and defending champions Louisville, for instance, were popular picks before the tournament began and they're still playing. So are three of the regional No. 1 seeds: Florida, Arizona and Virginia. What's more, Kentucky was a preseason favorite of many fans to end up with the trophy, and the Wildcats seem to be playing some of their best basketball right now. Give us your pick from among the 16 teams that are left. If you want to see the brackets so that you know the matchups for the next round of games, click here. Play resumes on Thursday.